I’ve often wondered what is the most difficult language to learn. It’s got to be one that uses a different script. Mandarin, Russian or even Greek perhaps? Well no….there’s only one winner. No one speaks it, although everyone tries to read it without much success. The weird hieroglyphics are printed onto a label and sewn into some obscure part of every item of clothing you own. Can anyone understand those weird circles and triangles printed in a row? 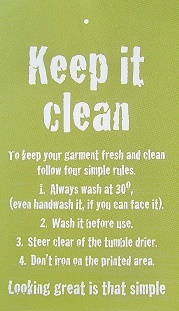 They are meant to give you, the clothes wearer guidance and advice about how to wash your garment. Why then are they so hard to follow? They always seem to be printed in a light grey which hard to see, and in a tiny font that is impossible to decipher, even under a microscope. And even if you can see the symbols clearly you are left none the wiser on how to wash your garment. It just all looks too complicated and detailed. Take a look here to remind yourself. You end up having two choices. Never washing your clothes in fear of ruining them (not advisable), or just putting them all together in the tub and hoping they survive intact, without fading or shrinking. Faced with this problem, we produce specific guidance for our products and attach a Keep it clean tag to all items sold online. The wash instructions are simple… hot washes are fine, but you the tumble dry at your own peril. This is because our online products are digitally printed, and the print doesn’t like the hot air and tumbling around. Products bought at independent retail shops are usually screen printed. These can be tumbled dried, although we don’t necessarily recommend it. Hang ‘em up and leave them to dry is a better option. Learn to fold well and they can look great without the need to iron. And whilst we are on that subject, always iron your Climb it Range garments inside out.